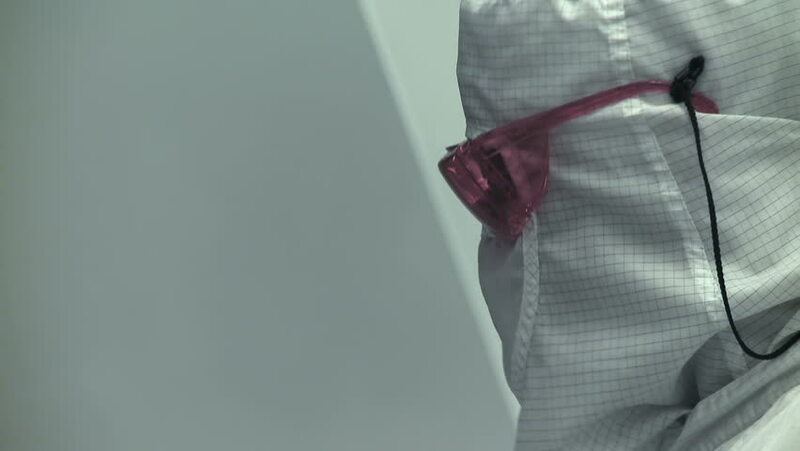 Technician checking a photographic process while working on silicon chip manufacture in a clean room, wearing safety glasses and a full body white "bunny suit" coverall to avoid contamination. hd00:03The financial success of the business. hd00:26Scientists and technicians working on silicon chip manufacture in a clean room, wearing full body white "bunny suit" coveralls to avoid contamination. Extreme long shot. hd00:19Two scientists / technicians oversee a photo-chemical part of the process during silicon chip manufacture in a clean room. hd00:22Technician operating kiln buttons while working on silicon chip manufacture in a clean room, wearing a full body white "bunny suit" coverall to avoid contamination. Mid shot. hd00:25Big close up of a technician working on silicon chip manufacture in a clean room, wearing full body white "bunny suit" coverall to avoid contamination. hd00:29Scientist / technician writes a report and then returns to working on silicon chip manufacture in a clean room, wearing full body white "bunny suit" coveralls to avoid contamination. Wide view.